DB objects reside. E.g., there might be a replicated ERP schema managed by SLT, a Netweaver/BW schema managed by the Netweaver Stack, and a “native” HANA schema, all residing in the same HANA instance and all of them consumed by the same data warehouse application. On database level, tables and other DB objects from different schemas can be accessed just by providing the corresponding object privileges to a user. Synonyms can be used for convenience or to improve design, but are not needed. In XS Advanced (XSA) based HANA data warehouses and applications, development is schema-less. A developer can only access the “local schema” that is generated for the application. Access to objects in other schemas has to be done via private/local synonyms or projection views created in this local schema. In this series of three blogpost I will introduce the basic concepts, show how synonyms can be used to access objects in a remote schema, and explain the more complex concepts like configuration and service replacement. Even though I focus on HANA data warehouses, this document also applies to the usage of synonyms in XSA application development in general. I will not cover projection views explicitly, but include them in one of the example repos. An introduction on synonyms in general can be found in https://blogs.sap.com/2016/12/05/using-synonyms-in-sap-hana/ . There is also a short introduction, showing some synonym features at https://blogs.sap.com/2016/07/03/xs-advanced-features-using-synonyms-using-non-hdi-container-schema-objects-in-hdi-container/ . The following picture shows the principle. Changing the schema names is optional. In XSA DB objects reside in an HDI container, which is a generated schema. Development has to be done in a schema-less way. This isolates HDI containers from each other completely and makes it easier to deploy multiple containers into the same system, have several developers work independently from each other etc.. Using synonyms is therefore the designated method to access objects in other schemas. In a pure SAP BW environment without any native HANA development you might not need this level of isolation. But as soon as native HANA development with multiple development teams becomes part of the use case, the isolation of HDI containers is an extremely powerful security mechanism, superior to the classic repository in that aspect. Before continuing, we need to understand the object owner and user concept of XSA. 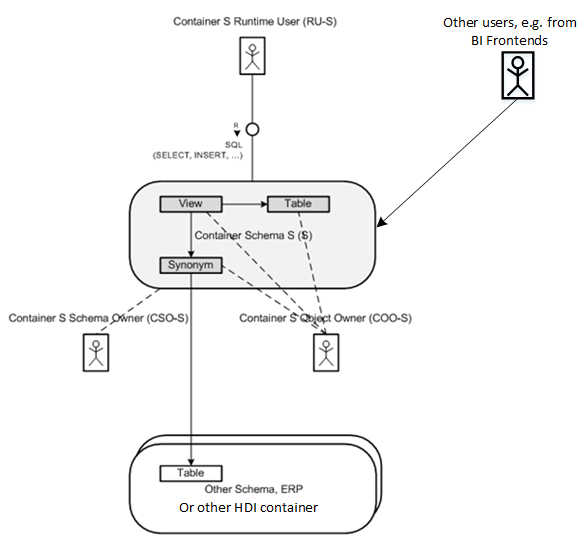 Several pre-defined users are generated for each HDI container. Some examples access tables in a classical DB schema. A repository with the description how to generate the schema can be found at https://github.com/CGilde/syn-prov-classic . Some examples access tables in an HDI container. A repository with the description how to generate the schema can be found at https://github.com/CGilde/syn-prov-hdi . The complete coding examples can be found in public github repos at https://github.com/CGilde . All examples were tested on HANA 2.0, but most features are available already in 1.0 SPS12. I will finish with the most trivial example I can think of. Probably the most often used public synonym in HANA is DUMMY. Since DUMMY is a public synonym pointing to table SYS.DUMMY, for usage in XSA a private synonym pointing to table SYS.DUMMY has to be defined first. To keep things simple, no namespace is used (.hdinamespace file with empty name and option “subfolder” : “ignore”). To test the synonym, a short function is created by including a file TEST_FUNC.hdbfunction in the db folder of the project. This function uses the newly created synonym DUMMY and can be called from the HANA runtime tools (hrtt). Executing this function in hrtt/Database explorer will give the application user of the generated HDI container as result (see above for details on the different users involved in HDI). The repo for this example can be found at https://github.com/CGilde/syn-dummy . The basic concepts of synonyms in XSA and the users involved have been explained and a very simple example has been shown. This example simplifies the creation of synonyms a little, because we did not have to consider privileges. The generated HDI users involved already have the object privileges needed to access SYS.DUMMY by default. The only use case I can think off for creating synonyms without considering privileges is accessing system objects, for which the access privileges are automatically assigned to the generated HDI users. This could be e.g. some monitoring tools or extensions to the tooling around the Web IDE. In the following post, I will create synonyms pointing to objects I defined by myself. first of all thank you for your posts on synonyms. They are very well written and comprehensive. Thanks Markus, I corrected the issue.